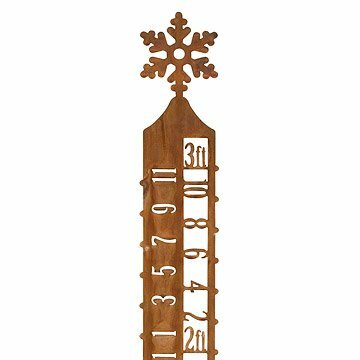 Form meets function in this charming snow gauge by Chris Crooks. Form meets function in this charming snow gauge by Chris Crooks. Inch marks climb up the steel design, measuring up to three feet and topped with a sweet snowflake. Use the included stakes to place the gauge near a window, so you can watch the snow pile up--and kiddos can eagerly wait for the flakes to reach snow day status. Handmade in Arizona. I can't wait for a good amount of snow to see how it works. I got this as an 11 year anniversary gift for my husband (steel anniversary). It has a lovely vintage look and is much larger than I imagined which will make it easy to read from the house. He's a weather buff and thought it was a fun and unique gift. A lovely piece of garden art that served a great function during the storm! I bought it for a gift & now I want one for my yard! The snow gauge is positioned in a garden out back and after our first snow of the season we were easily able to clearly read the total of 3.5" from inside the house. It has been terribly windy this past week and it hasn't budged. My husband has wanted one of these for years and is thrilled it was one of his gifts--so happy to have found this on your website. We haven't put it outside yet, but looks great! This snow gauge is such a fun addition to the snowdrifts in our backyard. It is easy to read and adds a little whimsey to the otherwise mundane winter months. The color also pops with the white in the background.